Ryanair and easyJet are the stingiest airlines for passenger legroom, a new survey has found. The annual Business Traveller Airline Survey looks at how much space travellers with airlines’ economy class. The detailed study found that Ryanair has the narrowest economy seats out of the 32 airlines surveyed, offering just 16 inches of width. Rival carrier easyJet offered passengers between 17.3 and 18.1 inches in terms of width, putting it 6th place. However, the no-frills carrier came 31st on the list in terms of legroom – offering passengers just 29 inches. Ryanair fared slightly better for legroom, coming 24th on the list – offering fliers 30 inches. 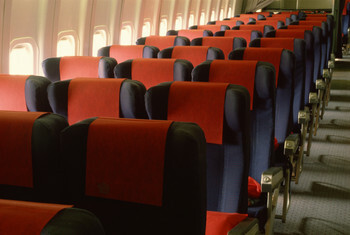 British Airways (BA) was the only other UK airline to feature in the study and came in 21st place for legroom, giving travellers between 30 and 31 inches. It also came in 8thplace for width, offering between 17.3 and 18.1 inches. The business class bed for BA was ranked in 16th place with the length ranking from 72-78 inches. BA’s sister airline Iberia offers the least legroom with just 28 inches on its A319S and A320 aircraft. Despite this, Iberia passengers can enjoy 30-32 inches of legroom. Emirates offers the widest seats at 18-20.5 inches. Cathay Pacific and Singapore Airlines give its customers the most space to stretch their legs, according to the survey at a massive 32 inches. However All Nippon Airways offers between 31 and 28 inches, depending on the aircraft. When heading overseas, it could be worth taking travel insurance. This will give you peace of mind should anything go wrong on your trip. Travel insurance covers a number of different situations while you are abroad, from medicals bills to passport theft. It is advisable to take out specialist insurance for certain holidays such as winter sports travel insurance for a ski break.